SUNSPOT, N.M. - At a small solar observatory tucked away in the woods of a national forest here, scientists and other personnel were commanded last week to leave at once. A week later, the facility remains vacant, and no one is willing to say why. The mysterious and lengthy evacuation, in a state known for secretive military testing and a suspected UFO crash, has spawned a wealth of speculation. Did the researchers spot something extraterrestrial? Was the solar telescope hacked by a foreign power and deployed to spy on, say, the state's missile testing range? Or is there an innocuous explanation, suppressed only because of corporate and government resistance to transparency? 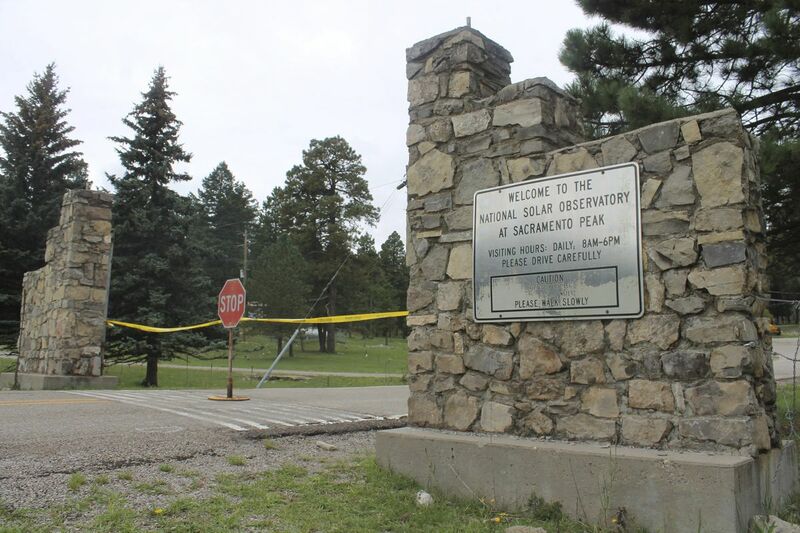 On Friday, the entrance to the National Solar Observatory was blocked by yellow crime scene tape and two security guards, who said even they had been kept in the dark. The guards, from Red Rock Security & Patrol in Las Cruces, New Mexico, didn't give their names, but said it was the first day the company was guarding the entrance and only the "director and an assistant" were allowed in. There was no obvious sign of law enforcement activity. "We don't know anything. We're just as curious as anyone else," one guard said. A spokeswoman for the nonprofit group that runs the facility said the organization was addressing a “security issue,” but would offer no additional information, other than, “I can tell you it definitely wasn’t aliens.” She said Friday the facility “will remain closed until further notice.” Neither the FBI - which was spotted on the premises around the time of the evacuation - nor those who worked at the facility would tell local law enforcement what had happened, said Otero County Sheriff Benny House. "They wouldn't give us any details," House said. "I've got ideas, but I don't want to put them out there. That's how bad press or rumors get started, and it'll cause paranoia, or I might satisfy everybody's mind and I might be totally off base." Unlike some of New Mexico's other research facilities, the solar observatory in Sunspot is not usually shrouded in such secrecy. The facility - in the Lincoln National Forest in the southern part of the state - is open to the public, and the scientists who work there offer guided tours of the site, said James McAteer, a professor at New Mexico State University and director of the Sunspot Solar Observatory consortium. When they're not doing that, they use a special telescope and other instruments to study the sun. There are homes on the site where staff members live. The Sunspot observatory sits at more than 9,000 feet and is part of a larger astronomy research facility on the site. The adjacent Apache Point Observatory, a collection of telescopes about a half-mile away, was operating as normal on Friday, with about a dozen cars parked outside. House, the sheriff, said that just before 10 a.m. on Sept. 6, staff at the Sunspot facility called to report they were "evacuating the building," and asked if deputies could assist. He said a sergeant and a deputy were dispatched and told upon arrival that the FBI had been there earlier. But neither staff, nor the bureau, would explain why the facility had to be vacated, House said. He said a volunteer fire chief claimed the FBI had told him there had been a "credible threat" but would provide no details. The sheriff's office, House said, saw no evidence of a threat, and left after a few hours. "We tried to find out the threat and what their concerns were," House said. "They wouldn't identify anything. They were pretty hush mouthed about it." McAteer said his consortium assigns four researchers to the facility, although the Association of Universities for Research in Astronomy (AURA), another consortium, manages the buildings and other infrastructure with another four or five people. That consortium, McAteer said, had ordered the site vacated, providing no other reason than a "security" issue. He said the researchers did not spot anything in the sun to necessitate them leaving, nor were they aware of any scientific reason - such as an anomaly in the data they were collecting - for doing so. "My people, we didn't do the evacuation, and we do the science," McAteer said. The property manager also came in to the post office on the facility and asked the woman working there to leave, but gave no indication why that was necessary, said Rod Spurgeon, a Postal Service spokesman. Spurgeon said post office operations have continued at the nearby Cloudcroft facility. Kinsey Featherston, a spokeswoman for Rep. Stevan Pearce, R-N.M., said the congressman's office had reached out to the FBI and were told "it is an ongoing investigation." "We will continue monitoring the situation, but at this time, we have no information," she said. An FBI spokeswoman declined to comment, referring questions about the matter to the consortium that manages the buildings. Shari Lifson, an AURA spokeswoman, said in a statement that her group was "addressing a security issue" and had "decided to temporarily vacate the facility as a precautionary measure." She said they were "working with the proper authorities on this issue," although she declined to specify who those authorities were. Lifson also declined to specify the security issue, other than to dispute the idea aliens were involved. The solar observatory is about a 2 1/2-hour drive from Roswell, New Mexico, the site of a now infamous crash in 1947 that the Air Force later claimed was an experiment designed to detect Soviet nuclear activity by monitoring sound waves. The incident sparked so much interest that there is now a UFO museum in the city. House said his deputies spotted a Black Hawk helicopter in the area around the time the building was evacuated - although he noted that is not uncommon. Sunspot and Apache Point offer scenic views of the Tularosa Basin, which includes two sensitive military sites, including Holloman Air Force Base and White Sands Missile Range. A public affairs officer at White Sands said there was no testing or other activity at the range that would have prompted the evacuation in Sunspot. As of Friday, the observatory was still shuttered, although McAteer said the researchers were ready to return "as soon as possible." The observatory even seemed to embrace the interest in the mysterious evacuation, writing on its website, "With the excitement this closure has generated, we hope you will come and visit us when we do reopen, and see for yourself the services we provide for science and public outreach in heliophysics." Zapotosky reported from Washington. The Washington Post’s Shane Harris and Joby Warrick contributed to this report from Washington.